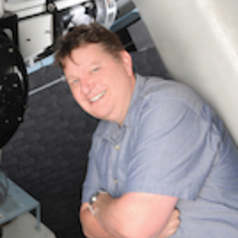 Mark is a professional astronomer, author and science educator working at the University of Hertfordshire’s Bayfordbury Observatory where he teaches observational astrophysics to undergraduates. He also deals with the day to day operations of one of the UK’s largest teaching observatories. He is actively involved in the Observatory’s extensive public engagement programme and runs a small outreach programme, independent of the Observatory, focusing on primary education. As an Ogden Science Officer, Mark will be working with secondary schools and their primary feeders in Hertfordshire and Essex in order to improve science literacy within the classroom. In addition, he will be working with teachers and parents to highlight the importance of physics to the UK economy and the necessity of a broad understanding of science in an evolving job market. He occasionally makes television and radio appearances as a pundit and has been a science consultant for a number of documentaries, television shows and movies. His current area of research is Star Spots on M-Dwarfs, star formation and ultra-high precision photometry with small telescopes. He also has an interest in star formation, galaxy structure and the application of Graph and Set theory.